Table lamp providing upward, downward and diffused illumination from its halogen light source and blown glass diffuser available in 3 colors. 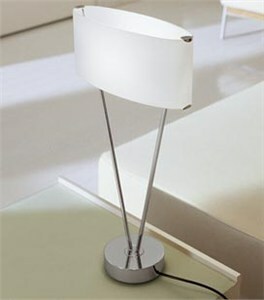 Companion wall, pendant, floor and other table lamps also available. The Murano glass diffuser is supported by a chrome plated frame and base. The halogen light source is shielded by a frosted glass cylinder. An in-line slide dimmer is provided on the black cord. 1 x 200 watts, quartz halogen, recessed single contact. Base and frame: Polished Chrome. Satin White, Satin Red, Satin Amber.